The greatest of our Ziplines at night! Moon Zipping, Los Cabos night zip line. Los Cabos night zip line tour takes place once a month during the full moon, and it’s an experience you can’t miss! Our location gives a clear and unforgettable view of the stars, without any interfering light pollution. The tour begins at sunset in the heart of El Tule Canyon, between San Jose del Cabo and Cabo San Lucas. This fun and thrilling adventure are for those who would prefer to explore the desert landscape after dark. It is perfect for families, friends or even for a romantic getaway. This tour is a very unique experience and therefore has limited space. We recommend making your reservations well in advance. We can easily accommodate larger private groups upon request. 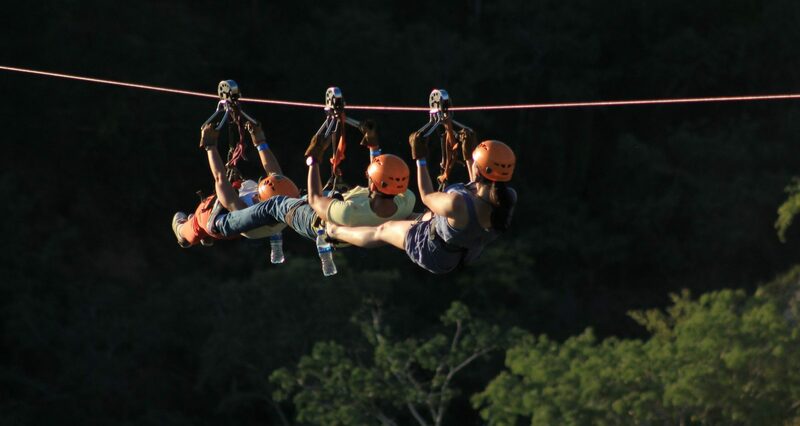 Our tour will take you through five different zipline runs, with the longest line being 2,673 feet long and about 300 feet above the ground. Each of our Los Cabos zip line night tours start with a basic introduction to zip lining, along with safety guidelines and rules. You’ll get instructed on take-off and landing positions to minimize the chances of impact jarring as much as possible. You’ll also get time to get familiar with your required safety helmet and headlamp. Each member of your group will also get free use of cupboards, a bottle of water and the choice of two beers or sodas, plus a food item from our menu. Booking your places a few weeks in advance is highly recommended for our night zip line tour in Los Cabos. To receive updates on our Moon Zipping and other tours, join our newsletter. Water bottle. Two sodas or beers. A menu option of Lion’s Den restaurant. Highly qualified, bilingual guides. Professional equipment: helmet and goggles. Training and induction class. Headlamps available for rent (Not included). ⁽¹⁾ Weight per person. ⁽²⁾ Line 1 through 4. on line 5. Max. Weight is 250 lbs. or 113 kg. Winter: 06:00 p.m. | Summer 05:30 p.m.
Our transportation is included in the purchase of your activity. Pick up time depends on your hotel location. Find here your pick up time. With your safety in mind, the use of cameras is not permitted during the tour. Our professional photographers will be there to capture your adventure at all times.